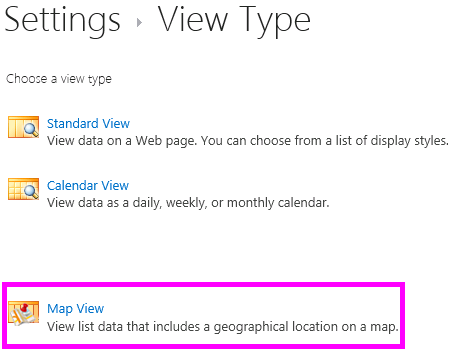 Learn how to display location information by using a map view in SharePoint lists. You can create a map view manually via the SharePoint user interface (UI) or programmatically by using the new Geolocation field type. SharePoint introduces a new field type named Geolocation that enables you to annotate SharePoint lists with location information. For example, you can now make lists "location-aware" and display latitude and longitude coordinates through Bing Maps. An entry is typically seen as a pushpin on a map view. 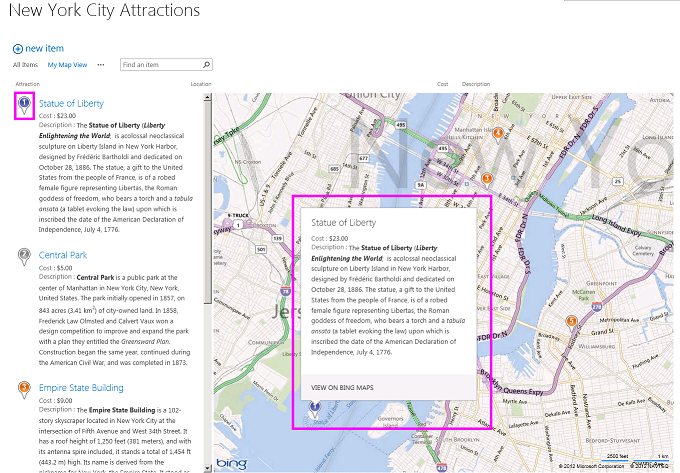 To display a map view in a SharePoint list, you must use the Bing Maps services. The Geolocation field is not available when you create a list by using the UI. Instead, this field must be inserted programmatically. For information about how to render and work with this data type programmatically, see Integrating location and map functionality in SharePoint. The Geolocation field and the map view enable you to give spatial context to any information by integrating data from SharePoint into a mapping experience in web and mobile apps. This article does not explain how to render the Geolocation field or provide developer guidance for creating a location-based mobile application; it does provide instruction for creating map views programmatically and from the SharePoint UI by using Bing Maps. An MSI package named SQLSysClrTypes.msi must be installed on every SharePoint front-end web server to view the Geolocation field value or data in a list. This package installs components that implement the new geometry, geography, and hierarchy ID types in SQL Server 2008. By default, this file is installed for SharePoint Online. However, it is not installed for an on-premises deployment of SharePoint. You must be a member of the Farm Administrators group to perform this operation. To download SQLSysClrTypes.msi, see Microsoft SQL Server 2008 R2 SP1 Feature Pack for SQL Server 2008, or Microsoft SQL Server 2012 Feature Pack for SQL Server 2012 in the Microsoft Download Center. Access to a SharePoint list, with sufficient privileges to create a view. Important: > You are responsible for compliance with terms and conditions applicable to your use of the Bing Maps key, and any necessary disclosures to users of your application regarding data passed to the Bing Maps service. What is a map view? A map view is a SharePoint view that displays a map (with data obtained from the Bing Maps service), using longitude and latitude entries from the Geolocation field type. When the Geolocation field type is available on the SharePoint list, a map view can be created either programmatically or from the SharePoint UI. 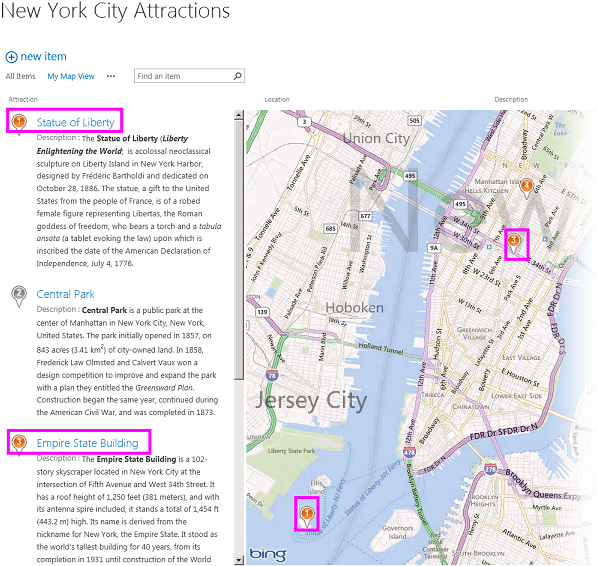 In the list, SharePoint displays the location on a map powered by Bing Maps. In addition, a new view type named Map View displays the list items as pushpins on a Bing Maps Ajax control V7 with the list items as cards on the left pane. Any SharePoint list can have maximum of two Geolocation columns in it; you won't be able to add a third Geolocation column in the same list. A map view can have only one Geolocation column. You can create multiple map views with different Geolocation columns. 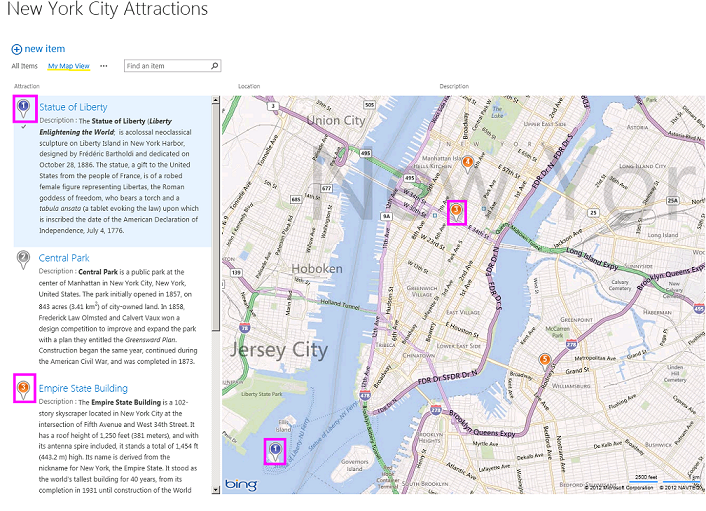 The following steps demonstrate how to create a map view from the SharePoint UI. 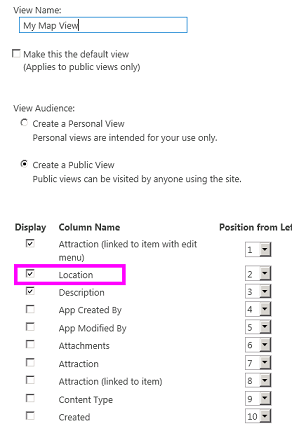 Open the SharePoint list with Geolocation column. Choose Create view from the ECB (Edit Control Block) menu, as shown in Figure 1. On the Choose a view type page, choose Map View, as shown in Figure 2. After you choose a view type, you can select various fields to display in the map view, as shown in Figure 3. > At least one **Geolocation** field is required to create a map view. You cannot select multiple **Geolocation** fields for a map view, although you can create two different map views that use two different **Geolocation** fields. After you add the required Geolocation field and any other field you need, choose OK. A map view is created, as shown in Figure 4. 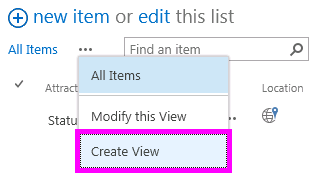 Follow these steps to create a map view for a SharePoint list programmatically. // Replace <Site URL> and <List Title> with valid values. // Replace <View Name> with the name you want for your map view. Replace and with valid values. Navigate to the list. You should be able to see a newly created view that has the name you specified in the preceding code. A map view providesthree colors of pushpins (as shown in Figure 5), each of which provides a difference user experience. A pushpin on the map has the same color as the pushpin of the matching item in the left pane. Orange Indicates that the Geolocation field for the item is mapped with the Bing Maps services. Grey Indicates that the Geolocation field for the item is empty. The item cannot be mapped with Bing Maps services, so no pushpin for this item appears on the map. After you create a map view, all items appear as pushpins. The user can get more information about an item by hovering over a pushpin, as shown in Figure 6.